Ranjini Iyer was born in Germany and grew up in India. She trained as an engineer mostly because she hero worshipped her PhD holding dad. She then got herself an MBA in the U.S and stayed on. Even as she pursued careers as a business owner, small business consultant, film producer and non-profit managing director, there always remained an urge to write that had been there since childhood. Following the birth of her children, she focused more and more on writing. Eventually, some of it became passably good. The Colossus is her first (well…published) novel. 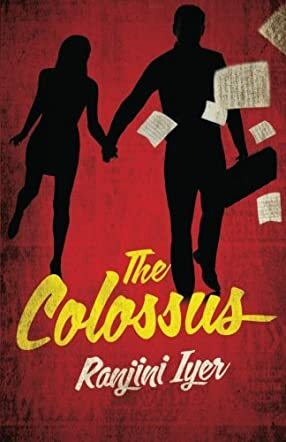 In a wonderful and exciting new mystery from debut author Ranjini Iyer, The Colossus, readers will follow caterer Maxine (Max) Rosen as she stumbles upon a mysterious coded document of her father's, which seems to be a link to the Nazis, pharmaceuticals and medical research. Max has been haunted by her father's alcoholism and eventual suicide, and wonders if this coded message might be the key to figuring the enigmatic man out. But when she realizes that she and the rest of her family might still be at risk, and that much more is at stake than a simple interest in what her father's issues may have been, well, that's when the action really starts. I loved this book. Loved it. I could probably end this review right there, but I don't think that would do justice to The Colossus or the fantastic new author Ranjini Iyer. Combining mystery with historical fiction, author Iyer does a fantastic job of bringing in both history from WWII and ancient India in a modern day tale of intrigue. She also creates characters that the reader will truly care about, exciting scenarios, and such vivid scenes that you will feel as if you are actually there. If those skills aren't the hallmark of a fantastic author, I'm not sure what is. The Colossus would be enjoyed by any reader who loves mysteries, historical fiction, or just a plain great book of fiction. I am pleased to recommend this book, and am so looking forward to seeing what author Ranjini Iyer has in store for her readers next.